at last! our final day of fun in dc ushered itself in on sunday morning. our flight wasn’t until the early evening, so we had plenty of time together before everything came to a close. after getting our packing done, we headed out the door for brunch, but wait! not before i can coordinate these adorable photos on the stoop of our chinatown home! aah, i looked at them and could hardly contain myself. what a great trip because of these gems! nathan, sarah, jamie, lenora, me, alison, kiley, garth. 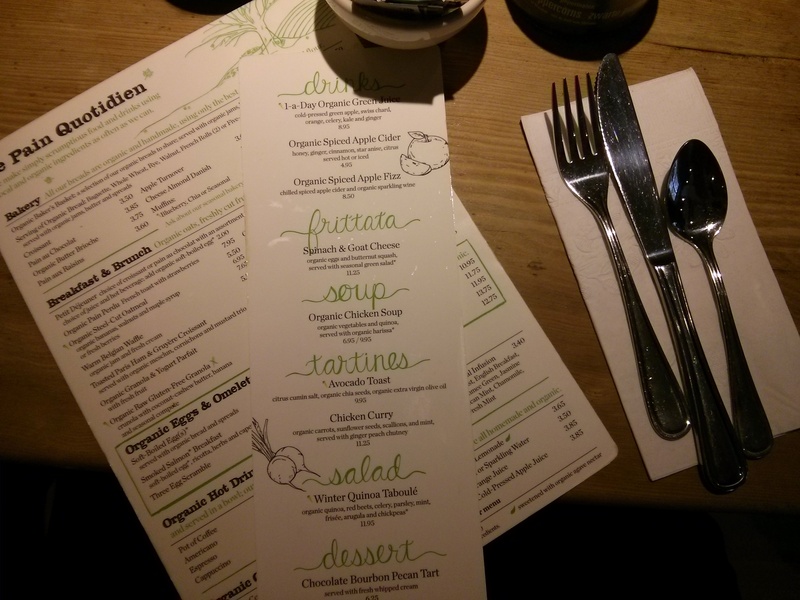 our restaurant selection was an easy one, as sarah wanted to go back to le pain quotidien for some hot chocolate and eats. the bakery was moderately busy downstairs, so we hoofed it to the second floor to sit together at one long table. it was quieter up there also, which means we enjoyed each other’s company a little easier. everyone was a bit quieter that morning, a little tired from all the fun we’d already had. down on the end of the table, i minded my own. i have always liked the feel of this place, very french country kitchen-esque. i always feel relaxed when i come here, and when i say “always,” i refer to the two times i have been here in my life. but, hey, two for two isn’t bad! we started with drink orders, and i gave into sarah’s convincing by ordering a soy hot chocolate for myself. sarah had seriously been craving it all weekend long, and i was happy we were able to find time to make it here for her. now, when you order a hot chocolate here, they bring it to you in a charming and unique fashion: the milk is already steamed and poured in your mug, but the chocolate is in its own tiny little pitcher so that you can make your hot chocolate as rich as you like. sounds fun, yes? i agree! i have to say with the tiniest bit of regret, though, that i wasn’t all that impressed with the actual taste of the drink. sarah, please do not hate me! i wanted to love it just as much as you do, because who doesn’t like make-your-own hot chocolate with all these cute little dishes? it might have been because the chocolate wasn’t mixed in when the milk was the hottest, or perhaps i didn’t like the actual chocolate itself. whatever the reason, i begrudgingly drank nearly the whole mug, even though i much rather would not have. nathan got us started off right with a bread sampler basket. we hadn’t really eaten since dinner the night before, so we were quite ready to load up on some carbs. they have lots of different preserves and toppings for your bread choices, my favorite being the blackberry jam. give them all a try, if you care! things of varying heights, including a honey bear! we placed our orders with the waitress and then….we waited….and waited….and waited some more. someone suspected she may have been the only waitress in the joint, but on a sunday morning at eleven a.m.? that is a prime brunch hour! i would have thought they would be better prepared, but hey, i’ve never worked in the restaurant business. this is just my expert diner opinion. take it as you may. our food arrived eventually (as well as refills on the water, for which we rejoiced greatly). 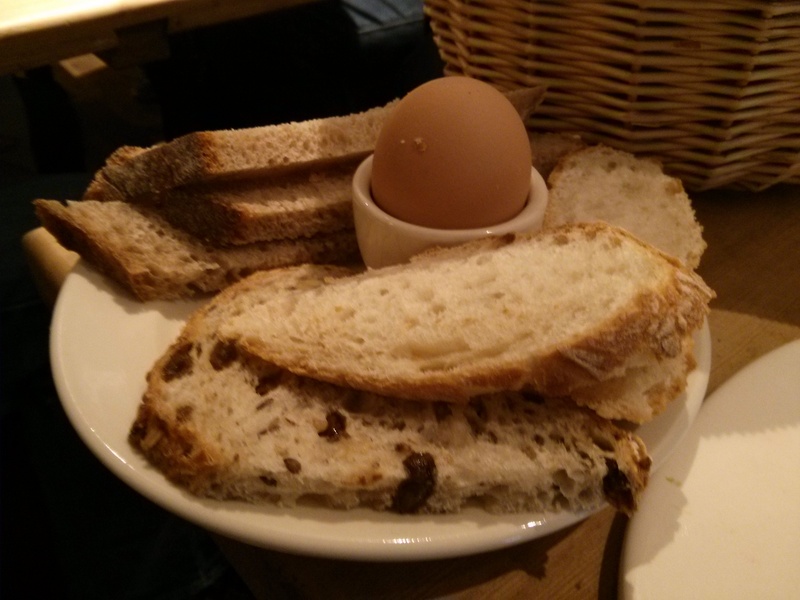 to my left, alison had ordered a soft-boiled egg, which look so stinkin’ cute in its little egg cup. i don’t remember her review exactly, but i think she was pleased, for it’s something she doesn’t have often but enjoys when she does. 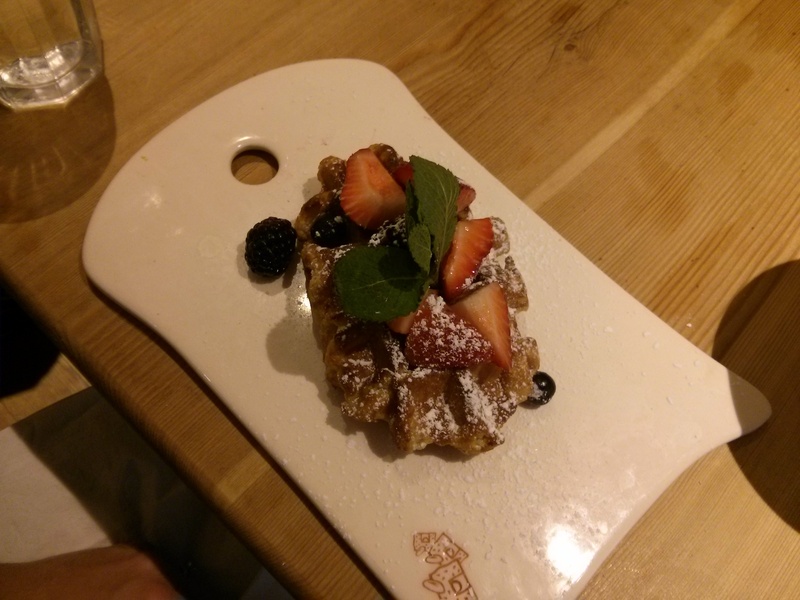 alison also had the warm belgian waffle that, again, had great presentation. it’s small, but if you order it alongside something else, i suspect it would be the perfect size. i think someone else at the table had it also, and if i recall correctly, there wasn’t any left on the plate. the rest of the table was covered in plates full of omelettes, at least from what i could see. i personally went with the paris ham & gruyere omelette, which was just what i needed. that salad, though? quite unnecessary, for even though i took a few bites out of obligation, it seemed pointless along with the rest of the meal. my omelette was nice and warm, with generous amounts of ham. i could have gone with a little more gruyere, but i LOVE cheese, so i can always have more. we paid our checks, stumbled down the stairs, and headed out to who knows where. lenora and sarah went off to a museum, and jamie and greg went to go look at natural history. the rest of us? eh, we were down for whatever. we walked towards the mall, naturally, and took our time. those of us left had been to dc several times before, so we were ready to just relax. the capitol building, in all its restorative beauty, did have a very large tree in front that caught our eyes. we watched tourists snap their photos, grabbed some ourselves, and admired the child-made ornaments that were covering the tree’s limbs. i know the national christmas tree was wonderful this year, but this capitol tree, the people’s tree, was rather impressive as well. it was a gift from the chippewa national forest and leech lake band of ojibwe in northern minnesota. hm, how ’bout that. although it could have been much colder outside, we were ready to warm our hands and faces for a bit before heading home. we didn’t have too much time left, so we ducked in the u.s. botanic garden to check out the model train exhibit. we hopped in line and then? then we waited some more. today seemed to be a day to test our patience, yes? i’m seeing a trend, too. we entertained one another until we turned the corner and entered the exhibits. there were memorial and building sculptures made out of natural materials that were quite well done. the child in me only wanted to touch to satisfy my curiosity, but i showed some restraint and simply observed from a safe distance. we finally entered the train room, and it really was quite a sight worth the wait. although the focus seemed to be more on the foliage the trains were racing around and through, it was a masterpiece nonetheless. i can only imagine a young child being enthralled with the majestic creations. it wasn’t before long that i took a look at my watch and announced it was time to head out. the walk back to chinatown was leisurely as i dragged my feet, for i wasn’t ready for it all to be done just yet! dc is filled with such fond memories from all of the times we have visited, and i love that we love to come back as often as we do. as they say, though, all good things must come to an end, so until next year, until the sixth annual dc december trip, we’ll close this visit with a smile.